The Bancroft Library is pleased to announce the completion of the “Japanese American Internment Sites: A Digital Archive” which includes important historic materials from our archival holdings that are now available online. The project was generously funded as part of the National Park Service’s Japanese American Confinement Sites Grant Program and includes approximately 150,000 original documents from the Japanese American Evacuation and Resettlement Records (BANC MSS 67/14 c). The records represent the official documentation of the U.S. War Relocation Authority. Existing from March 1942 to 1946, the WRA was created to assume jurisdiction over the relocation centers, administered an extensive resettlement program, and oversaw the details of the registration and segregation programs. The project builds upon two previous grants conducted between 2011-2017 to digitize 100,000 documents from the Japanese American Evacuation and Resettlement Study and 150,000 original items from Bancroft’s archival collections including the personal papers of internees, correspondence, extensive photograph collections, maps, artworks and audiovisual materials. Together, these collections bring the total number of digitized and publicly available items to about 400,000 and form one of the premier sources of digital documentation on Japanese American Confinement found anywhere. 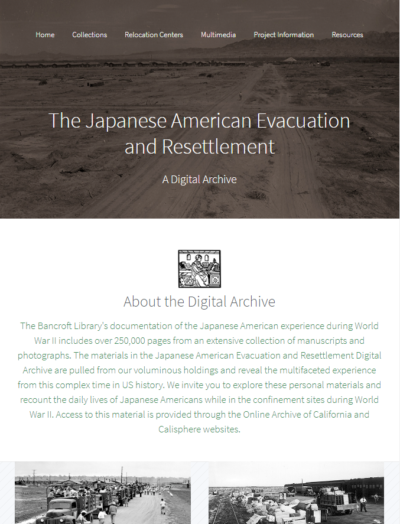 The Japanese American Evacuation & Resettlement Digital Archive website, http://bancroft.berkeley.edu/collections/jacs provides context to this rich and substantive digital archive, and directs users to collection guides on the Online Archive of California and curated searches of digitized objects on the Calisphere website.